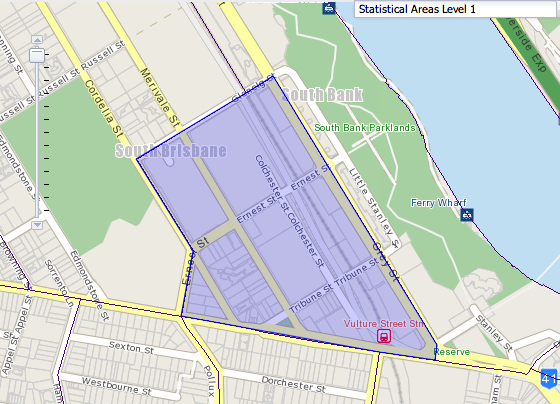 One area of Brisbane where there are many apartments is the South Bank area of South Brisbane. 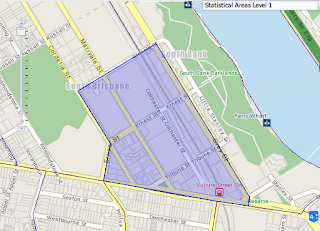 However, there is little data available about this area because it is leasehold land. The 2011 Census has some interesting data. The apartments in this area include Arbour on Grey, Saville Southbank (also known as Mantra Southbank) and Urbanest student accommodation. 66% have University qualifications (compared with 13.5% for Qld or 14.35 for Australia as a whole). Ancestry: "The most common ancestries were English 17.2%, Chinese 16.1%, Australian 11.9%, Irish 5.0% and Scottish 4.7%." Country of birth: "In 3111003 (Statistical Area Level 1), 31.4% of people were born in Australia. The most common countries of birth were China (excludes SARs and Taiwan) 6.0%, Hong Kong (SAR of China) 4.9%, Singapore 4.4%, England 4.2% and Korea, Republic of (South) 4.0%." 68% had both parents born outside of Australia.